TORONTO—A coup snuck up on South America last month, taking people around the world by surprise. The June 22 ouster of President Fernando Lugo Mendez and his replacement by Federico Franco, head of the right-wing Paraguayan Liberal Party, took place without heavy police or military repression. The Economist called the coup a "constitutional impeachment." There is no doubt that when he left office on June 22, Lugo bowed to the pressure of the Paraguayan Senate. While several governments in South America indicated they would not recognize the coup government, Canada and the US immediately acknowledged the incoming regime. "Canada notes that Fernando Lugo has accepted the decision of the Paraguayan Senate to impeach him and that a new president, Federico Franco, has been sworn in," Diane Ablonczy, Canada's Minister of State of Foreign Affairs, said in a statement following the coup. Lugo's final statement as president indicated he would submit to the request of the Senate and step down. Initially, he did not call for his supporters to take to the streets, and in fact through his words demobilized the Paraguayan people. Following the coup, however, Lugo stated that what happened was indeed a coup, and that he had been removed from office in the same style as Manuel Zelaya was removed in Honduras. "Here, there was a rupture of the democratic order, here there was a political trial without any reason, and a parliamentary coup was carried out. There are various names: an express coup, Cristina Kirchner [president of Argentina] mentioned that it was a soft coup," Lugo said during a radio interview a week after the coup. "The laboratory for all of this was three years ago in Honduras, and here in Paraguay it was perfected." 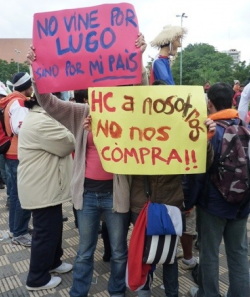 Unlike in the case of Zelaya, who was removed from Honduras to Costa Rica by Honduran soldiers, Lugo continues to reside in Asuncion, Paraguay's capital. Now in the thick of winter, Asuncion is cold, rainy and grey, and the level of mobilization is far lower than it was following Zelaya's ouster in Honduras. Even before the coup took place in Paraguay, tensions were mounting. Lugo's removal as president came after calls for his resignation on the heels of a massacre in the Curuguaty region east of the capital, in which at least 17 people were killed, including six police officers and 11 peasants. It was the first peasant massacre in Paraguay since the country's return to democracy in 1989. The campesino (peasant) movements in Paraguay are the most important social movements in the country, which is a little larger in size than the province of Newfoundland and Labrador, with a population of just over 6.5 million. The context of struggles around land, and in particular the events in Curuguaty in June of this year, are of great importance in order to properly understand the coup. "In Paraguay there are between nine and 11 million hectares of land that we call 'wrongly-granted land' ( tierras malhabidas ), which are lands that were granted in a fraudulent manner during the Strossner dictatorship, from 1954 to 1989, to children of the dictator, relatives of the dictator, business people from the region, even to other dictators like Somoza, and to members of the Uruguayan military," said Abel Enrique Irala, a researcher with the Paraguay Peace and Justice Service (Serapaj) who spoke to The Dominion from Asuncion, Paraguay. The June 15 massacre took place at Yvy Pyta, an area that is classified as having been mis-granted during the dictatorship and where the peasant movement had organized occupations at least four times. But at the time of the massacre, those who were occupying the lands were not connected to the larger peasant movement; they were called to participate by supporters of the Liberal party, of which Federico Franco is part. Following the massacre, press reports indicated that the police were killed by sharpshooters, but according to Irala, the only weapons found in the peasant camp at Yvy Pyta were machetes and homemade shotguns. "This occupation was not carried out in the framework of the peasant movement, or with the knowledge of support of any Paraguayan national or regional peasant organization," said Irala. The day after the massacre, Irala traveled with a delegation of activists and journalists to Curuguaty, where he said local Liberal Party bosses were already calling for Lugo's resignation and the promotion of Franco to the presidency. "The next day when we did the evaluation of what we saw, one of the things that really caught our attention was the relation between the [political] parties in that area, and the calls specifically for Lugo to resign and be replaced by Federico Franco," said Irala. "What we didn't imagine is that those speeches, made 170 kilometres from Asuncion, coming from what seemed like local party members...We would end up hearing seven days later, with the political trial of Lugo and with Federico Franco staying on as president." Since Franco took power, the commission entrusted to investigate the events at Yvy Pyta has been cancelled. In Paraguay, there have been actions to protest the coup, including a week-long occupation of a state-owned TV station by its workers, demonstrations in the capital, and international protests along with supporters in Paraguay's border areas with Brazil and Argentina. However, the overall level of social mobilization since the coup has been low. Paraguay was the last country in the region to break with a two-party system, with the election of Lugo, considered a progressive President, in 2008. "Since 2008, a sector of the best [social movement] leaders transformed into bureaucrats and took up residence in the capital, convinced that this was the path to gain more force," wrote Raul Zibechi, a Uruguayan journalist and analyst, following the coup. "Today, with some exceptions, the movements are the weakest they have been in decades." Though considered progressive, Lugo's government passed anti-terrorist legislation and declared a state of emergency across a number of departments (provinces) with a high level of peasant organization, once in 2010 and again in 2011. His government used repression to discourage peasant organizing and land occupations, and has maintained close relationships—especially with regards to intelligence sharing—with the US government under the umbrella of anti-narcotics initiatives. Paraguayan analysts and writers have also commented on the appearance of a "ghost" guerrilla movement, the Paraguayan Peoples Army (EPP), which they say has been used by the government to justify increasingly repressive tactics, including the use of Colombian-trained special forces, against the peasant movement. "The fall of Lugo, as in every political crisis, exposes the changes that are being produced in the region since Barack Obama defined the [United States'] new defence strategy," wrote Zibechi. Since Franco was named president, he has agreed to re-initiate negotiations with Montreal-based Rio Tinto Alcan, and has sat down to meet with various local, national and international representatives of transnational capital. "One can deduce that [Franco] has already met with regional, national and international business people, who represent transnational power," said Irala. While Rio Tinto Alcan represents the biggest Canadian interest in Paraguay, it is far from the only one. Bilateral merchandise trade between Canada and Paraguay last year was valued at more than $25 million. "Canadian companies looking into the Paraguayan marketplace may find opportunities in oil and gas, mining, and infrastructure sectors," according to the Government of Canada. Paraguay is also a participant in Canadian military training through the Pearson Peacekeeping Centre. Dawn Paley is a freelance journalist and co-founder of the Vancouver Media Co-op. An article focused on the coup government's resumption of negotiations with Rio Tinto Alcan was published by the Media Co-op on Friday.